So I'm sure many of you have been feeling the two lobes at the sides of your heads pulsing over the years due to whatever factors cause them to pulse (could be stress etc). It seems the Wingmakers music has shown great strides in actually initiating/activating these throbbing sensations around the temples. I've listened to the Wingmakers music for quite some time, and I have always thought that there were connections with binaural beats. Anyhow, after a few years of listening, I've realized over time (took me almost 3 years to really notice lol...), that there's beats, and rhythmic tones and all sorts of neat sounds playing in the left and right speakers/headphones (I prefer headphones). This is a reason why for Chamber 10, it is recommended to listen to the music with headphones. The program is Audacity. Free, yay. 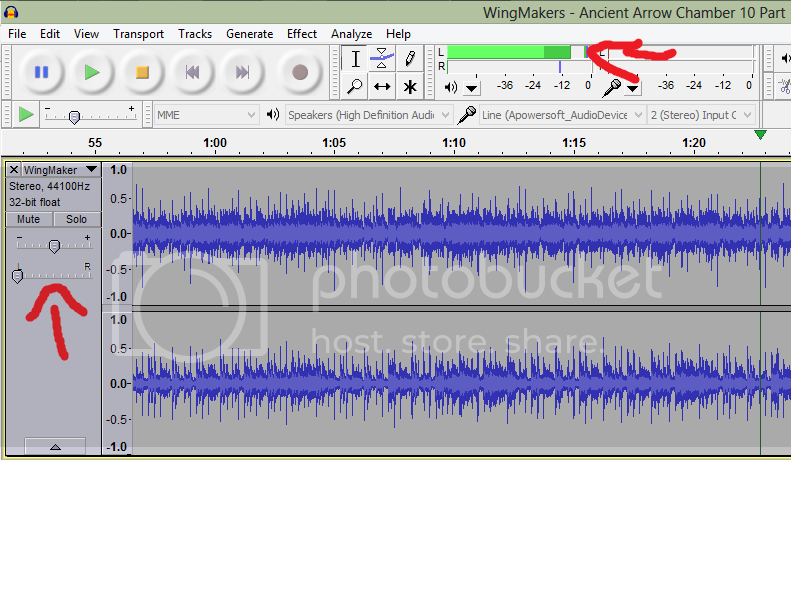 So I realize that Chamber 10 has a lot of these beats etc played in the other ears. You should listen to Chamber 10 part 1 with this awareness. (Just as a teaser). "In mathematics and physics, a soliton is a self-reinforcing solitary wave (a wave packet or pulse) that maintains its shape while it travels at constant speed." Wikipedia. To me, Chamber 10 music is key to the transformation process, and over the years, I have done my own research to discover what I experienced when I listened to it, as suggested (seven times in a row - uninterrupted), with the intent of "triggering the transformation" (because that is how it was introduced to me, in the original website, when the cd was new). the sensation, that I experience, since using this music to make myself aware of it - is very much like that feeling you get when you "switch" from one hemisphere of your brain to the other, however it happens almost like alternating electric currency ... from one to the other steadily - slow enough for you to detect each "switch" but fast enough that it "feels" like a purr .... personally I don't "feel" it in my temple area ... most of the time it starts in my core, but often I feel it in my arms or legs first ?... when I first became aware of it, I would look at my hands to see if they were shaking - I felt it that strongly ... I would wake up in the middle of the night - thinking there were earth tremors (but not stress related in my sleep) - I began to noticed it whenever I was "still", focused on "finding it" or during meditation - I began looking for it - and can "find" it at will now ... I can't say if was always there, or not - but I am aware of it now. It is, as James says (in the intro to this cd), "reassuring" to be aware of the resonance that using the HI's "whole" brain (in sync) produces - when-ever it happens - these frequencies are not exclusively found in the WMms - so it is probably "happening" all the time ... in fact, I didn't "feel" them while listening to the music until I was aware of them when the music wasn't playing but you will definitely "feel" a "pulsing" because that is how the HMS "interprets" your awareness of their presence.